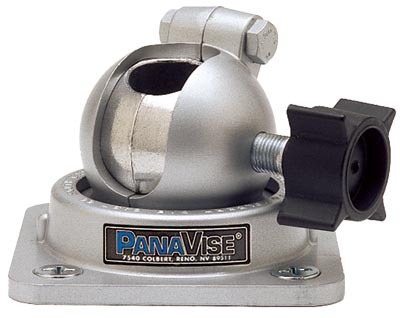 Using the carver's ball and socket design, this vice is capable of rotating around its own axis with a C-shaped top clamp, allowing the work to rotate in any direction, and upright to upside down in a single action. The 60mm diameter ball is designed to accept various faceplates, screws and lathe spindle replicators. The ball is securely locked by a large, easy to use, 'safety' handle, and the ball assembly is mounted on a hex bar so it can be securely held in a vice at the desired angle. The jig was tested with the optional multifunction base plate that accepts the hex bar and allows for mounting on a bench/lathe or vice. It provides height adjustment of the jig and allows it to be located in an endless amount of positions. The jig comes supplied with a 100mm faceplate and screw; the smaller faceplates, multifunction base plate and lathe spindle replicators can be purchased as required. This product will withstand work with a mallet, is portable and is great value for money. Dremel seems to be providing a good range of accessories and products for the carver, and the Multi-Vise seems to be one of them. It doesn't perform in the same way as the more traditional type vices and it isn't built to withstand the constant use of a mallet, but this lightweight, portable vice does excel in securing work with confidence, so perfect for finishing jobs and light carving. It can be attached to any surface up to 63mm in depth, and the jaws are able to grip an impressive 175mm, extendable to 200mm when the end cap is removed. 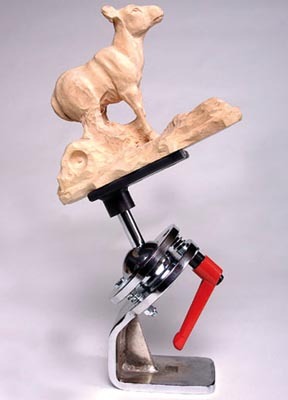 It is capable of rotating 360 degrees and tilts 50 degrees, and rather handily, the jaws can detached from the base unit for use as a stand-alone bar clamp. 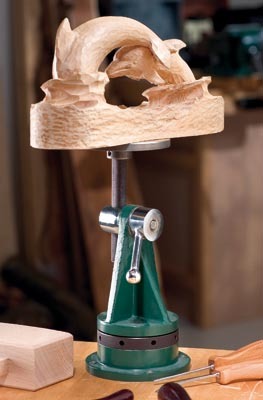 The Veritas Carvers' Vice is, put simply, a beautiful looking vice and it certainly doesn't disappoint in use. 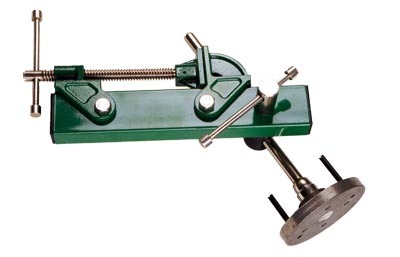 It bolts to a bench, can be clamped in a standard vise, or side or top mounted through a standard 19mm diameter dog hole using the dog mounting kit. It has full rotation in two axes and 3in of height adjustment in its third axis, so access to work is second-to-none. It also features a controlled release so that those all-important carvings won't suddenly drop or rotate whilst carving. This fully portable vice is great value for money, robust, secures the workpiece securely even when used with a mallet, and is readily available. It comes supplied with a 90mm mounting plate with an optional 50mm plate available to purchase, ideal for holding those smaller pieces. 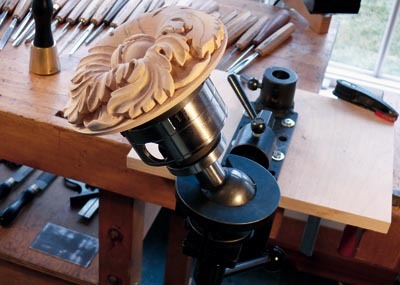 This carving vice came out very favourably in our round-up. 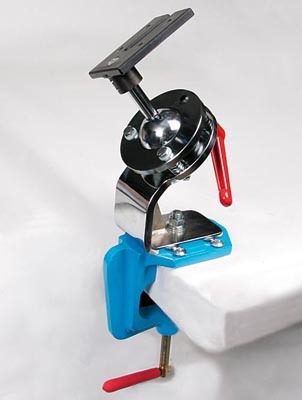 The B-4 robust body is fixed to the workbench via a carriage bolt and lock handle, or clamping the foot to the bench. The B4LC is fixed to the bench through a single hole fixing. Both models fare well with large and small carvings, relief and in the round, and feel reassuringly strong when work is struck with a mallet or hammer. The 63mm ball rotates through 360 degrees with ease, thus providing good access to the workpiece, and can be operated with one hand, leaving the other free to support and manoeuvre the carving. One of our testers would have liked the possibility of being able to add further faceplates to the B4LC model, plus more options for fixing to the bench but otherwise, both vices are excellent work holders. Jerry-Rig do not have a distributor in the UK but see their website for a list of distributors that will ship to the UK, or call them direct for further information. 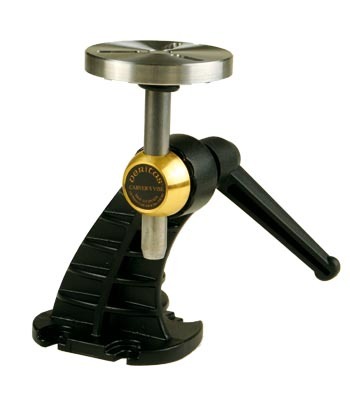 This vice from Dakota is simple in its design, but don't let this simplicity fool you. 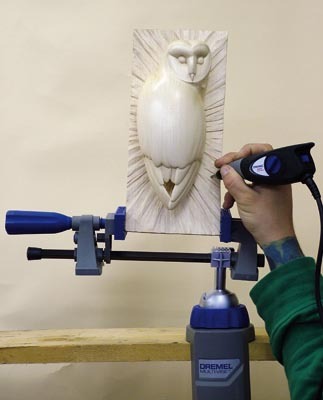 This is a rugged and versatile piece of kit that will hold your carvings securely, even when a bit of force is called upon, such as using a mallet or powertools to remove timber and rough out. 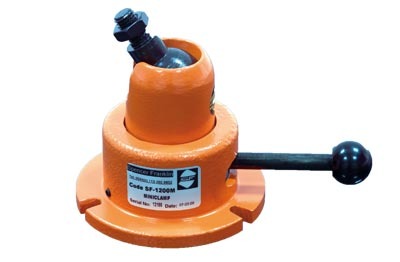 The round casting can be locked off in position with a handy securing pin. It will happily secure to a worktop up to 95mm in thickness. Attach your carving to the round casting using woodscrews, and then slide the main bar into the vice, and you're ready to go. Work can be rotated 360 degrees, and can be raised or lowered depending on your stance. This superb vice is ideal for those on a budget where sturdiness and reliability aren't compromised. This heavy-duty 80mm ball clamp from WivaMac really is a quality work holder for the carver who wants simplicity with steadfast results. It attaches to the work surface via a single bolt and will handle whatever type of carving you care to throw at it, whether it be big or small, relief or in the round. The workpiece can be tilted in all directions for full access, and is operated via a strong lever which allows the 80mm diameter ball to be clamped rigidly throughout all turns of movement. And because it is so rugged in design, you needn't fear taking a mallet to your work. The SPB1050 is portable so can be taken from home to club and back again with relative ease. The faceplate can be removed but currently you cannot pick up spare plates, which our reviewer would like to have seen, nonetheless, this did not stop him from giving full marks to this ball clamp. The SF-1200m Miniclamp and the SF-1400m Hydraclamp from Spencer Franklin are products that seem to tick all the right boxes, and certainly rated very highly from our group of testers. Fixed to the bench via a vice or bench mounted, the clamps handled a variety of work securely in varying sizes. The fully portable, mechanically operated Miniclamp is suitable for smaller carvings whereas the larger, heavier hydraulic operated SF-1400m will handle both large and small with ease. Faceplates can be removed on both of these models, with further plates available to purchase. 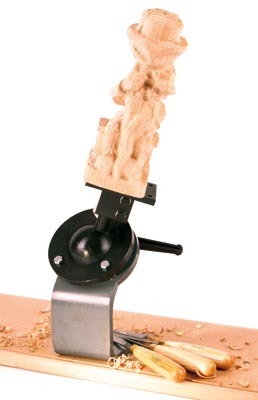 This excellent clamp from German company Kurt Koch will handle your carving with superb holding, whether securing large or small reliefs and in the round carvings. The kit is reassuringly heavy but not so much that it can't be transported from home to club. 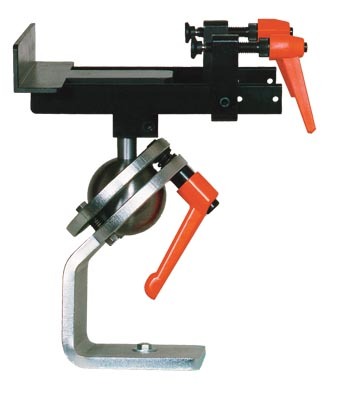 It can be used in a vice or bench mounted, and is easily operated with just one hand, leaving the other hand free to support and move the work around. The support arm can be moved through more than 180 degrees. The faceplate can be removed but as yet, there are no additional faceplates to purchase with this vice. 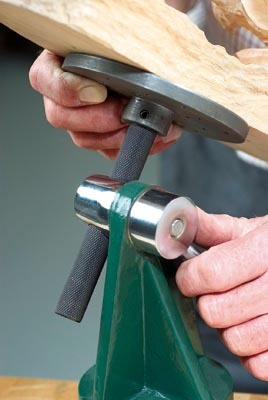 The vice is strong, sturdy and capable of withstanding continuous use with a mallet, keeping work secure in its grip. 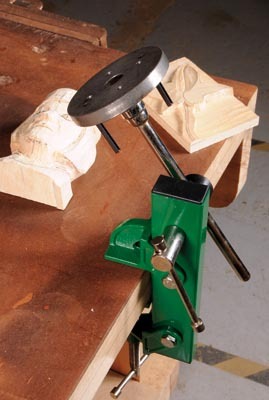 For those wanting that extra holding power to really tackle carvings with confidence, the heavy-duty, bench mounted clamp from Panavise could be the solution. Capable of securing in the round and relief carvings ranging between small to medium in size, the 400 allows work to be tilted in all directions for full access. It will tilt 180 degrees, turn 360 degrees and rotate 360 degrees, and can be operated sufficiently with one hand. The faceplate can be removed and additional faceplates are available to add to this vice. Powertools and mallets are fine to use with this product but our reviewers have advised that this is more suitable for lighter use. It is fully portable so not a problem carrying between classes and home. The only feature which our team of testers would perhaps change would be the fixing handles which are a bit small and fiddly, but overall, the 400 received a big thumbs up for being very good value for money, smooth in operation and a lifetime warranty. This lovely looking vice from Axminster Tool Centre is a strong, versatile, low cost vice that is well worth considering if you're in the market for a new work holder. Made from cast iron (body and base) with a steel mounting plate, this vice will tackle small and medium carvings, and can take the use of a mallet with ease. The workpiece can be tilted in all directions for access, and the support arm can be moved through more than 180 degrees. The vice is operated easily with one hand, and the faceplate can be removed, with additional faceplates available through Axminster Tool Centre via their online store, or over the telephone. As the vice is so solid and heavy, portability can be a little tricky, but not impossible, so getting between shows, clubs and home shouldn't be too challenging. 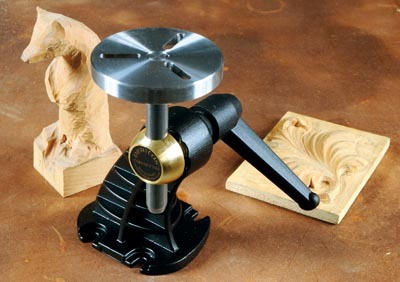 Readily available, this vice makes for an ideal product that many carvers will be more than happy with. It’s lookin’ a lot like Christmas!